Step 3 is done only once throughout this Moon series. Exhale quickly so that all the air is out of your abdomen (tuck your tummy in slightly), as you stretch yourself forward and down (see left). If you feel tension, inhale gently and exhale again. If it is hard to stay balanced, open your eyes and look at your knees, and place your hands somewhere on your legs or knees to help balance your body. Remember: It is important to not roll forward, but to pull the small of your back in and bend forward and down with your chest out and your back straight. This will prevent you from injuring yourself. CAUTION: If you have respiratory or heart problems, inhale and exhale slowly as you hold this position for a moment. It is better to not hold the breath for any length of time until you have strengthened your lungs and heart. If it is too difficult to hold this position balanced, stand against a wall and lean into it with the weight of your buttocks against it and your feet about a foot away from the wall. If you have a problem with your knees or back, bend your knees slightly until your body gets used to this movement. Some call this The Forward Bend. In Sanskrit it is called Uttanasana, which means to stretch the body lengthwise with intention. There are many variations to each Yoga posture (posture = asana). For the purpose of the Moon Series, this is to be learned as Eugenia shows it (above left) and then done during one short exhalation. There will be more on this site about this posture because it is a very important stretch for the entire body. This will only be repeated if you do the Moon Salutation more than once. Lift your kneecaps and stretch your knees before you get ready for Step 4—to bend your right knee and come down as Eugenia shows in the image below. Step 4 is repeated with Step 7 on the opposite side. 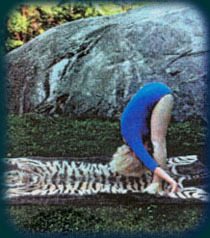 Inhale and hold your breath for a short moment as you place your right knee between your hands and fingers on the floor (see image of Eugenia, left). Your spine should be straight in this position. Stretch your left leg and let your knee touch the earth (as shown here). Your left toe will point out to the side and the inside of the left heel should be on the ground (as close as possible, at least). This is the goal. It' s not easy for most people. Eugenia just made it look easy! Try to hold your foot perpendicular at least. Even if you are not able to do this, just think about your foot finally reaching this position in the future and let it relax wherever it can be without pain. This position is wonderful for stretching and opening the pelvis region. Exhale as you get ready for Step 5 of The Moon Salutation. This position will be repeated on the opposite side in Step #7.